That was fast! I usually spend several days at the con, but this year it was a 24-hour turn around. Still, I got a good look at the floor and was fortunate to meet several fans. I caught a couple of our regular clone troopers walking around in Star Trek uniforms on Saturday – even a member of my own crew!! Luckily they switched back into their imperial officer uniforms for the 501st photo. 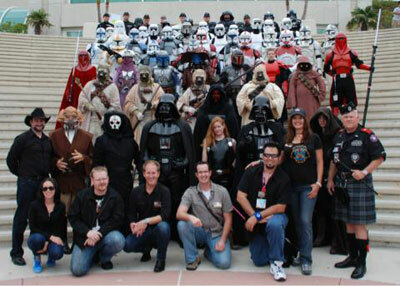 It’s always great seeing clones and Stormtroopers, bounty hunters and Tuskens getting together. If you are going to Celebration VI (which you should be), then you do not want to miss the gathering of the 501st – there’s really nothing like it. 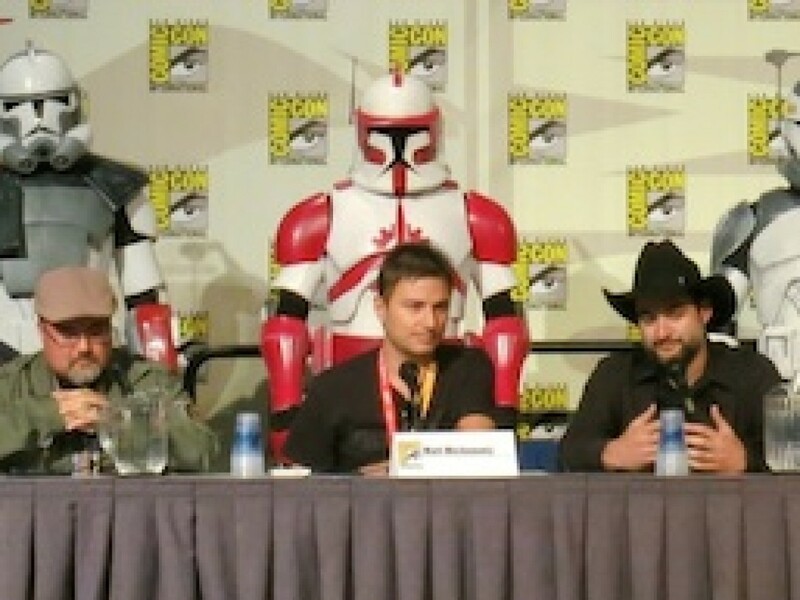 The Clone Wars panel on Saturday was great –thanks to everyone who was able to be there! 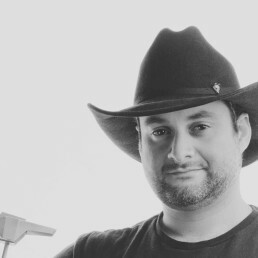 I thought Matt Michnovetz did a terrific job answering your questions and Pablo Hidalgo, as always, provided an excellent program for the event. 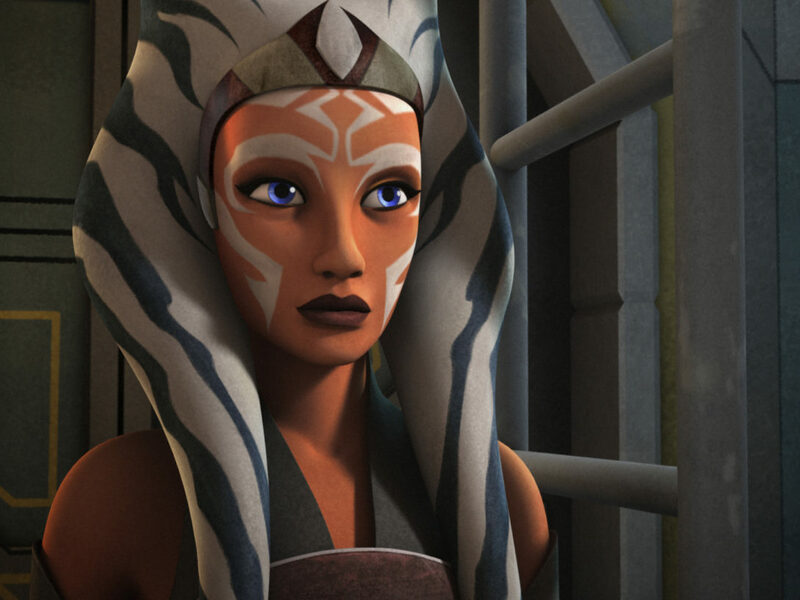 It was Pablo’s idea to bring the extra footage of the animation and layout takes from The Clone Wars Season Four Blu-ray, and that was fun to show. Our panels are a great way to share new content that has never been seen, even by people who work on the series. On Saturday, a sharp eye would have caught season one writers Henry Gilroy and Steve Melching in the crowd, along with Kyle “Quadinaros” Newman and Jaime King. Daniel Logan, the “Fett Favorite,” was there and I always like to point him out because you never really know what Daniel will do. 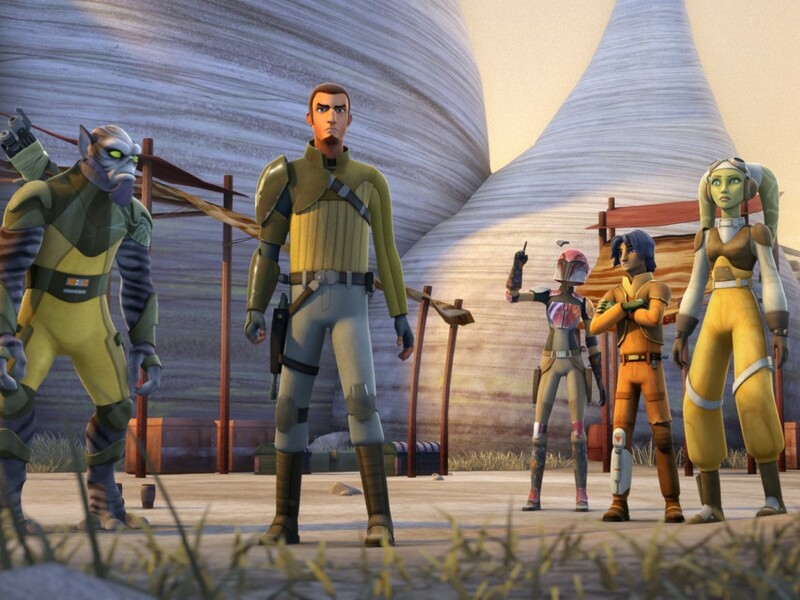 Bounty hunters are so unpredictable. T.C. Carson (the voice of Mace Windu) was there and, if you can believe it, this was his first Comic-Con! He was speechless but had a great time. Many important members of our Lucasfilm and Cartoon Network teams were there as well, excited to see the new footage and hear your questions. 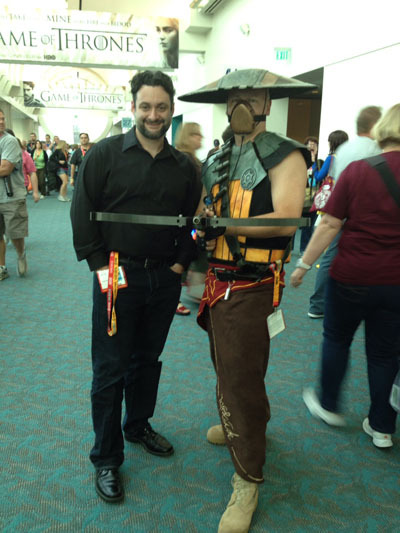 That’s another great thing about Comic-Con. You never know who you’re going to sit down next to, or see out later that night. I really enjoyed answering your questions this year. It’s often difficult to give you a direct answer on things and that’s frustrating for me because I’m a fan too. I know what it’s like to travel to the con and wait in those long lines. I really want to make sure you get the information you deserve for all that effort. Remember though, many of the truths we cling to depend greatly on our own point of view. Sometimes the truth is right in front of you, and has been said very clearly. Sometimes things are left vague intentionally. I always choose my words wisely when answering your questions and I do not want to mislead you. I try to give as much information as I can, without spoiling anything. So, craft your questions well – you have a month until Celebration. Talking Star Wars with all of you is one of my favorite pastimes and I always look forward to it. I didn’t get a chance to visit the Hasbro booth this time, but I saw some of the new figures online and I thought they looked great! I’m really interested in the vintage carded Clone Wars figures. It’s a humbling experience to walk around and see all the products people make based on the series. Statues, books, action figures, plush, greeting cards, ornaments, role playing toys, and all the LEGOS. Seriously, LEGO makes some great Clone Wars stuff! 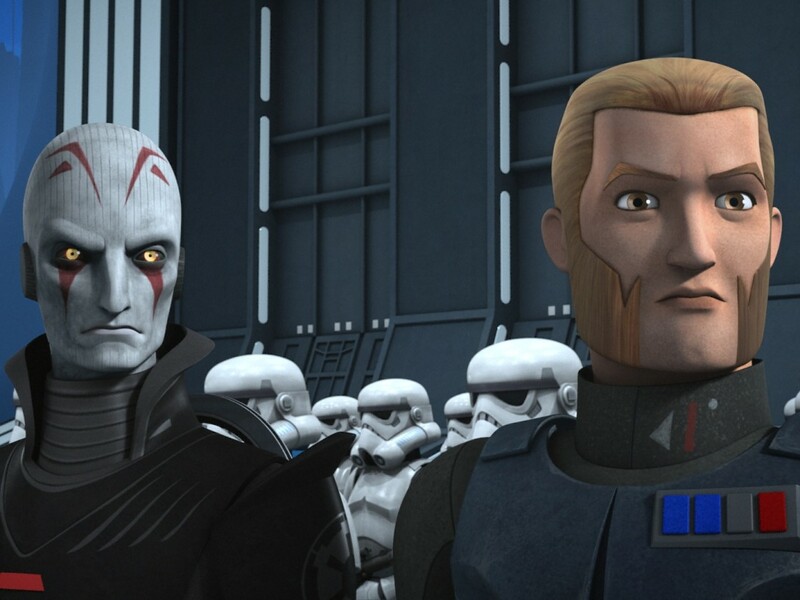 I still need a Commander Wolffe figure though. I was able to attend Ashley Eckstein’s fan fashion panel on Saturday evening and I am so proud of my padawan and everything she has achieved. 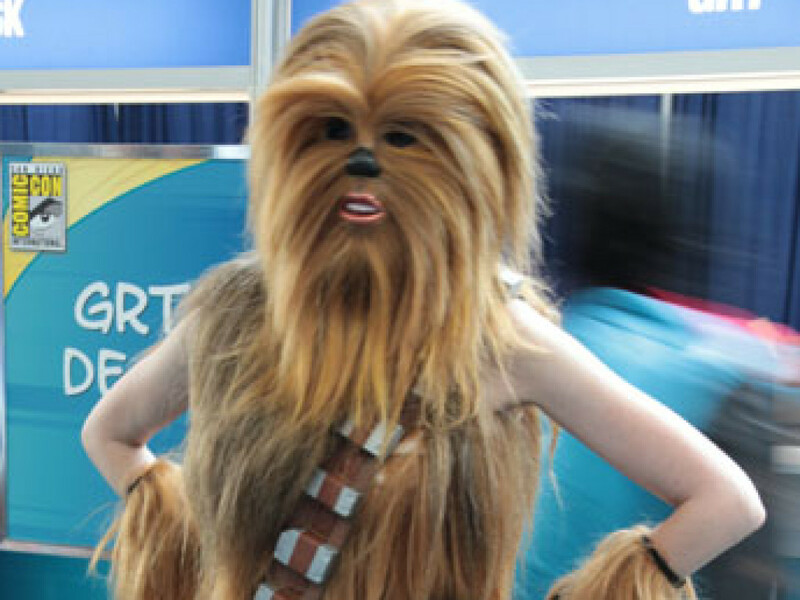 She gives her all and is doing her best to be an advocate for female sci-fi fans everywhere. This panel had a pretty amazing line-up of guests including Jaime King, who always has a great perspective on fashion and fandom. It was nice to see everyone’s favorite Senator from Naboo – Catherine Taber (voice of Padmé Amidala) on the panel, as well as my friend Bonnie Burton. It’s always great to see her and catch up. The girls who modeled at the show were great and their outfits were incredible. I’ve known some of them for a long time now and it’s always great to see them get their chance to shine. 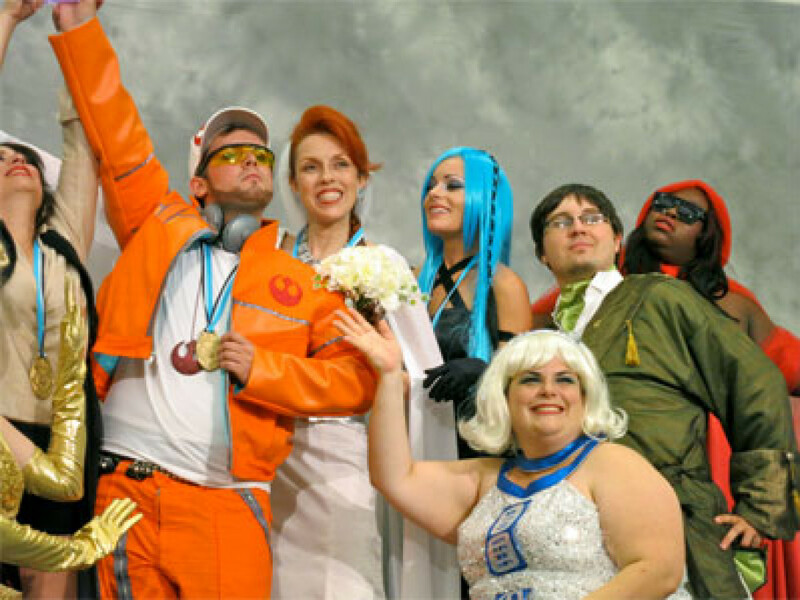 I did not envy the judges who had to choose just one winner from so many fantastic entries, but I was glad to see that a Star Wars themed Millennium Falcon dress won. I had taken a picture with the winner (Jennifer Landa) earlier, when she wore a similar creation – a Death Star dress. While we are on the topic of costumes, I happened upon a fan in an amazing Embo costume. This was the first one I had seen in person and it looks great! Too bad I didn’t have my hat on! All in all it was a great Comic-Con. It was great seeing everyone and I hope you all enjoyed the season 5 sneak peeks. I’ve got the team working hard to prepare even more exclusives for Celebration. 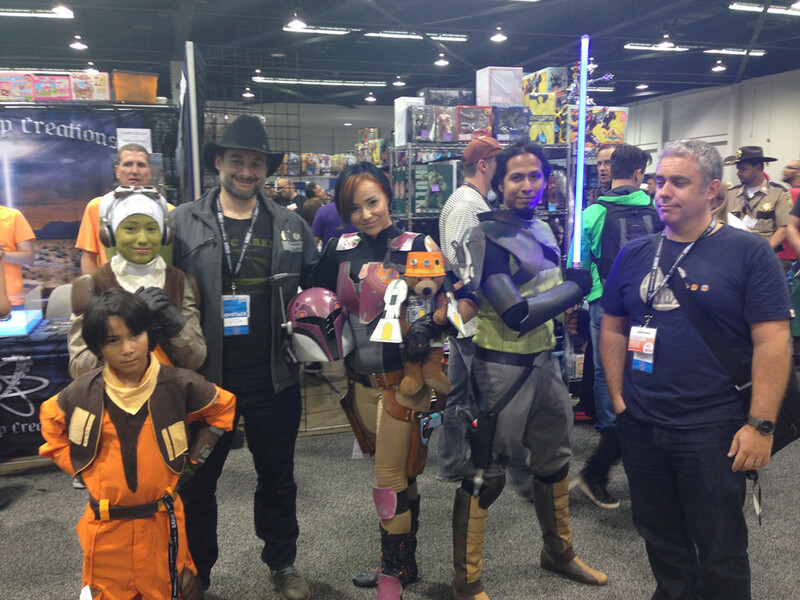 Thanks again for coming out and supporting us at Comic-Con. See you in Orlando!!!!!! 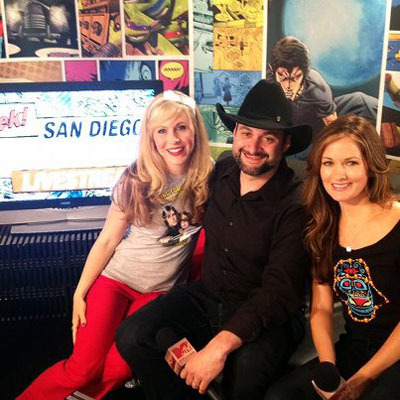 Editors Note: Check out the video interview from SDCC with Dave, along with Ashley Eckstein and Catherine Taber, on MTV.com!